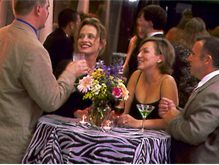 Social Event Catering New Orleans | Food Art, Inc. This is fantastic! The food’s to die for, the location is wonderful, the band is fabulous, and everyone’s having a great time -- especially you! The most unforgettable parties -- chic and stylish, themed or casual -- make you the belle of the ball or the host of the town. To assure that your personal "festival" is extraordinary, we offer the most meticulously detailed planning, imaginative design and haute edibles... to create a unique and delicious reflection on you. Your personal Food Art planner comes to you with a wealth of expertise, fresh ideas and endless energy... the ingredients essential in making your party an enviable and dazzling affair!